So it happened. Here we are, after Thanksgiving and we thought we were safe from turkey. But now it is time for turkey revenge. There are a number of great variations you can use when you are thinking of the set up for this one. In the end no matter how you make it, it will still be tasty. sweat the onion and garlic in the oil till translucent then add the mushrooms and cook through. Add the flour and cook till blonde (slightly darker than white, should have a smell like popcorn or something akin to that). Whisk in the stock, heat to boiling and then cook for 10 to 15 minutes more. If you are so inclined you can make your own pasta for this, just like we have done in the past (Pasta). When rolling it out on the pasta roller it will be a little thicker than normal. I roll it till setting 6 on the machine. At the same time cutting the noodles is fairly easy as well. I cut mine diagonally across the width of the pasta dough, roughly 1 inch wide. Cook the noodles in boiling salted water just as you would other pasta. To serve the noodles you can either warm them in the microwave (roughly 30 seconds) or add them directly to the sauce. Using mushroom or veggie stock this dish can be easily made vegetarian. Cutting vegan egg roll wrappers in a similar size you could even make this a vegan dish. Different variety of mushrooms make a great substitute for the turkey. 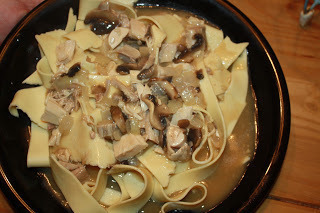 6 Responses to "Turkey Pappardelle #leftovers"
That sounds yummy. And I really like that you included a fresh pasta recipe. Thanks! I have always tried to keep the cooking stuff fairly short, especially when making videos. This means that there are posts that build up to a bigger project at times. Pasta being such a versatile item, it is always good to have an idea of how you can make your own. It also helps that fresh homemade pasta is easy to do and so much better than store bought. This looks outstanding! Different from the thousands of left-over turkey stuff that I have tried over the years. The home made pasta would make it even tastier. Always good to have something just a bit different to make those leftovers stretch. Looks delicious! Nice way to enjoy leftovers!